I’ve always been more of a cook than a baker. Cooking is easy–and if you mess something up when you’re cooking, it’s often a matter of making a few adjustments here and there to right the ship. Baking doesn’t work that way. Measure even slightly wrong and your muffins are hockey pucks and your cakes are collapsed in the middle. But! I’m working on it. Mostly because it’s fun to bake with my daughter. It can be hard to find recipes that are reasonably healthy, that she’ll eat, and that actually work out (unlike the apple paleo muffins that stuck to the wrappers and had the texture of baked grits–I’m still bitter about all the ingredients I wasted on those). When I had the chance to receive a review copy of Henrietta Inman’s The Natural Baker, I knew that I’d love it even before I laid eyes on it. Because: natural? Yes! Baking? Like I said: working on it! And it was pretty much everything I thought it would be and more. Recipes range from savory to sweet, whole wheat to grain-free. This Walnut and Flaxseed Banana Bread is gluten-free, made with oat bran, flax, and almond flour instead of wheat; while my family isn’t gluten-free, there’s so much wheat flour in modern diets that I try to mix things up by using other grains when I can. Sweetened only with ripe bananas (the browner the better!) 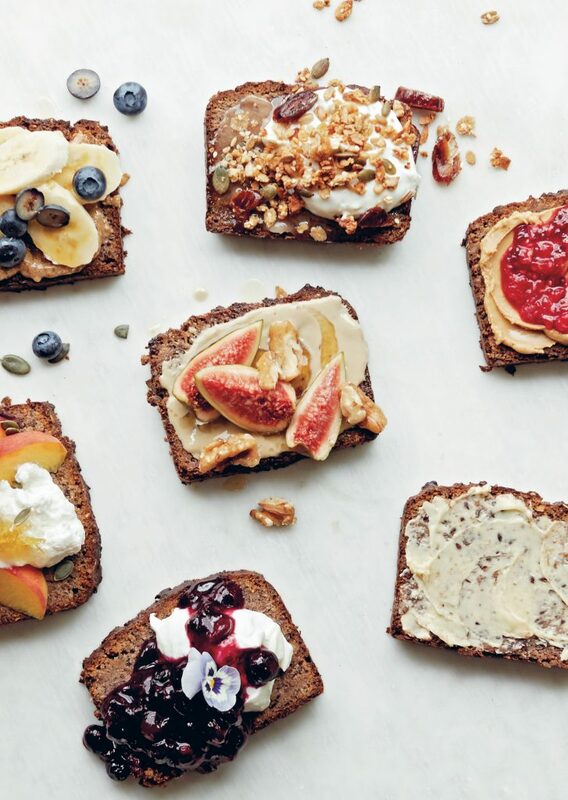 and honey, this is bread that’s delicious to eat, fun to make, and perfect for slathering with peanut butter and your favorite toppings. A gluten-free banana bread sweetened only with honey from Henrietta Inman's The Natural Baker. Reprinted with permission from Quarto. Preheat the oven to 180°C/350°F/gas mark 4. Oil a 18 x 11 x 8cm (7 x 4½ x 3in) loaf tin (pan) and line the base and sides with a piece of baking parchment, so it’s easy to remove the bread after baking. In a food processor, process the walnuts until fine. Add the ground almonds, salt, nutmeg, cinnamon, baking powder, oat bran and seeds and process to combine. Use a spatula to scrape the ingredients off the bottom of the bowl and process once more. Pour the batter into the prepared tin (pan) and bake for 40 minutes. Reduce the oven temperature to 160°C/325°F/gas mark 3, rotate the tin (pan) and bake for a further 30-40 minutes, until a skewer inserted in the centre comes out just clean and the top of the loaf is dark golden brown and firm to the touch. Leave to cool in the tin (pan), then remove from the tin (pan) and serve. Keep in an airtight container in the fridge for at least 1 week, or cut and freeze in slices for up to 1 month. When it’s less fresh, it’s nice warmed up a little in the oven, on a baking tray (sheet) lined with baking parchment. Variation: Raisins or other dried fruit, whole nuts and other seeds are all nice additions to the batter, each lending a little more flavor and texture.